The late 70’s and early 80’s is when pinball first changed from the EM style to digital electronics. 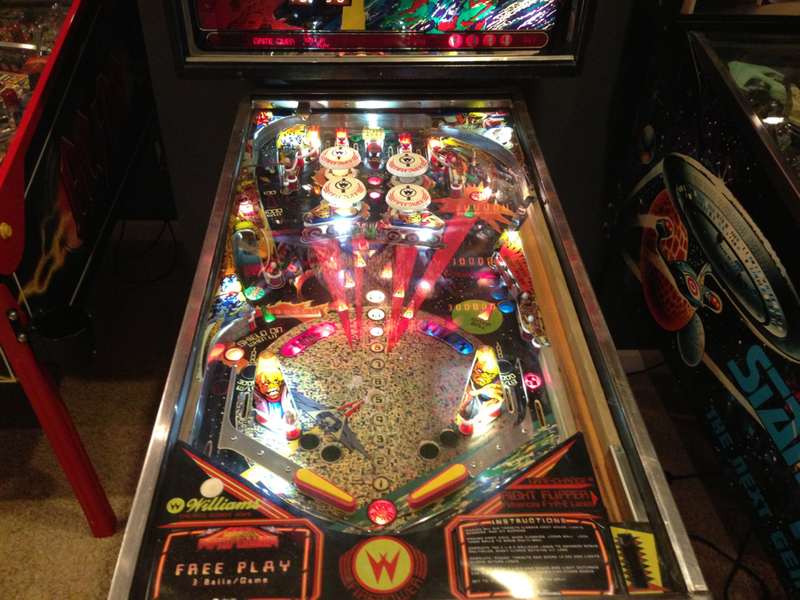 Along with this came some of the best pinball machines ever made, ones that are still lots of fun to this day. I’ve played a ton of these games, so I’ve made a list of my top 5 pinball machines from the 80’s. This is probably the most famous game of the group. Produced in large quantities, this game was a mainstay in arcades and bars for years. Based upon pool, it has an easy to learn ruleset but is difficult to master. One of the things people really loved about it on location is the amount of free games and extra balls you could earn from it in different ways. Prices on this game is $1500 to $2500 usually for the original version, the limited edition that came with the smaller head is less desirable and is generally a lot less expensive (even though it’s the same game). Like all the early Bally games, it has great artwork. It is also one of the first games to feature speech. Probably the best looking game of the early 80’s, it features a fantastic backglass and playfield of an ocean dive. I restored one of these about 5 years ago, it was a great game. I actually regret selling it quite a bit now, but not much I can do about that now. It’s also one of the most expensive games of that era, Fathom will cost you at a minimum $3000 and probably closer to $4k for just an average example. Fathom like Firepower features a 3 ball multiball. I think Fathom’s is better though, because it doubles and triples the playfield depending on how many balls are remaining. It also has a 1, 2, 3 target bank up front that if you hit them in order and then hit the standup target to the right, you can earn an extra ball. Fathom is like a lot of the Bally games of that era, it’s very bonus heavy. The best strategy is to try and get all of the blue and green multipliers to 5x and then get that bonus elevated for major points. Firepower is one least attractive early games but also one of the best playing games. Featuring a three ball multiball, it’s a pretty hard and fun game to have at home. I owned one for about a year, I really liked it other than the fact that the electronics on it were a little flaky at times. The basic ruleset is that you need to complete the bank of targets 1 through 6 to light 2 of the 3 lock locations. From there, you need to lock a ball in both of those places to start the Firepower multiball, which is a pretty cool sequence. Depending on which of the locks lights up, it can be pretty difficult to start the multiball. The lock in the back of the game in particular needs strong flippers to reach. The one good thing about Firepower is that it’s cheaper than a lot of other 80’s games. They made a ton of them and the general unattractiveness of the game compared to other games has kept the price at a reasonable $1000 to $1500 range for the most part. Sometimes you can even find them cheap broken since the electronics weren’t the greatest. The first multilevel game ever created, the Black Knight was a huge hit when it was released in 1980. I owned this game for about a year as well. I liked it a lot but not as much as Firepower or Fathom, mainly because the music was kind of annoying and most of the game revolved around getting the ball to the upper playfield (there is updated code that addresses this issue now). One of the cool things the game features is a magna save, which is an extra button on the side that you press to save the ball from the outlane. It works pretty good most of the time, although occasionally it contributes to your demise. Flash Gordon is one tough game. It was basically Bally’s answer for Black Knight, their first two level playfield. Unlike other games of the era though, Flash Gordon doesn’t have any multiball, it’s just the toughest single ball game of that era according to many players. It has a similar ruleset to most of the other Bally games of the era. The main focus is you try and hit targets to get double or triple scoring for 15 seconds, although honestly keeping the ball alive that long would be a feat most of the time, lol. It has the same bonus features of the other Bally games, that’s one of the things I really like about games of that era. Paragon: Probably the best art package of any game of that era. The backglass is just stunning. Black Hole: Featuring an upside down playfield underneath, it was something totally mind blowing compared to everything else at the time. Stargazer: Fantastic Art, good playing game, and very rare. It’s unlikely that you’ll ever get to play one except for maybe at a show. Centaur: A lot of people have this game as their favorite. It might have the biggest multiball of the era at 5, but I’m not sure 100% sure. I really like the game, but the art is only so-so for me (although a lot of people love it). Hopefully this list of top 80’s pinball machines has helped you discover some games you haven’t heard of or pointed you towards some games to aspire to. I’m looking to add a Flash Gordon here at some point myself, might take a while though.